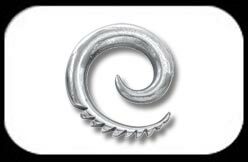 Steel cast Ear Spiral for Stretched Ear Piercings. Sizes from 2mm - 6mm. Spirals are sold as single Spirals (1 piece).